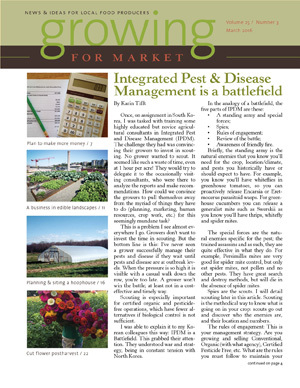 The April issue of Growing for Market is out! For those of you growing sweet potatoes, Andrew Schwerin from NW Arkansas has written an interesting article. I’ve written about starting sweet potato slips before and I have a slideshow that includes three methods of starting your own slips. He and his wife Madeleine grow 1500 feet of sweet potatoes each year, a third of their growing area. I was interested to note their reasons for growing so many sweet potatoes (apart from the obvious fact that they can sell that many). Sweet potatoes are not a big moneymaker in terms of the space occupied. Here at Twin Oaks we pondered similar issues this winter when deciding which crops to grow. We worked down a list of 25 factors, deciding which were important to use. We chose our top handful of factors and then worked down a list of crops we might grow, awarding points (or not!) for each factor for each crop. This helped us narrow down what to focus on this year. And yes, we are growing sweet potatoes! I wrote about this in Growing for Market in February 2017. They like Beauregard, and wanted to try using the single node cutting method, as advocated by Anthony and Caroline Boutard – see my Sweet Potato slideshow for details. Initially they were excited about the single node cutting process, as their roots produced exponentially more growing shoots each week. OK, maybe exponential is a bit of an exaggeration, but it gives the sense of it. Because they had so much propagation material, they started making 5-node slips, rooting clusters of cuttings in pots of compost, 3 nodes in the soil for roots, 2 nodes above ground. Some of their single node cuttings failed to thrive, both in the trays and in the field, so they developed a 2-node cutting system instead, and also used their five-node slips. And so they had a trial of three sweet potato cutting methods, with plants in different 100 ft beds. 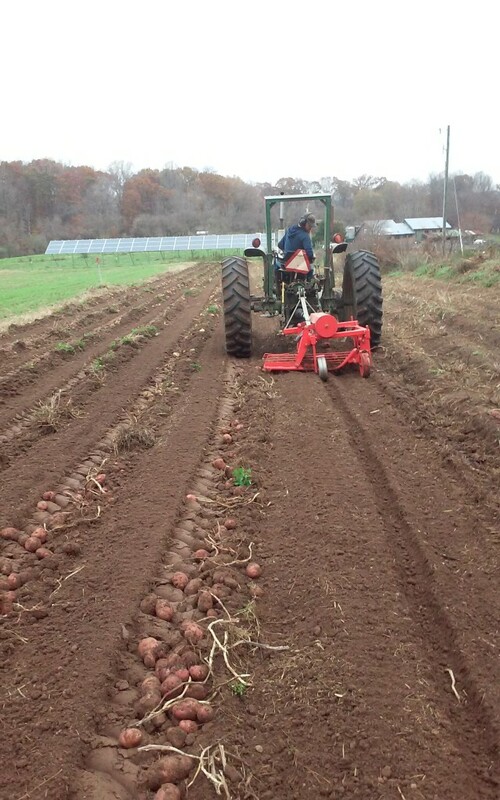 In the past (using the regular slips method) they have averaged yields of 500-600 lbs of sweet potatoes per 100 ft bed, with a range from a poor 250 lbs to a few successes with 1000 lbs/bed. Of course, yield is not the only important feature of a market crop, although understandably it has a high profile for those growing 1500 row feet for sale. 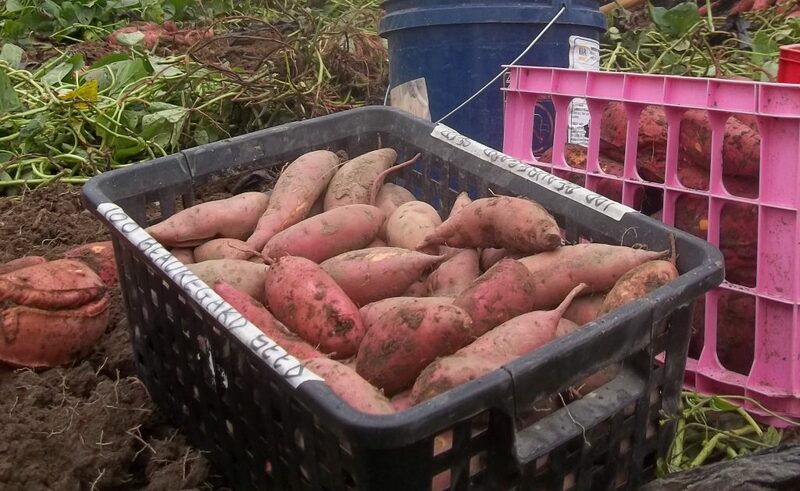 At harvest, they found that their single-node sweet potato plants were producing a couple of hundred pounds per 100 ft bed. 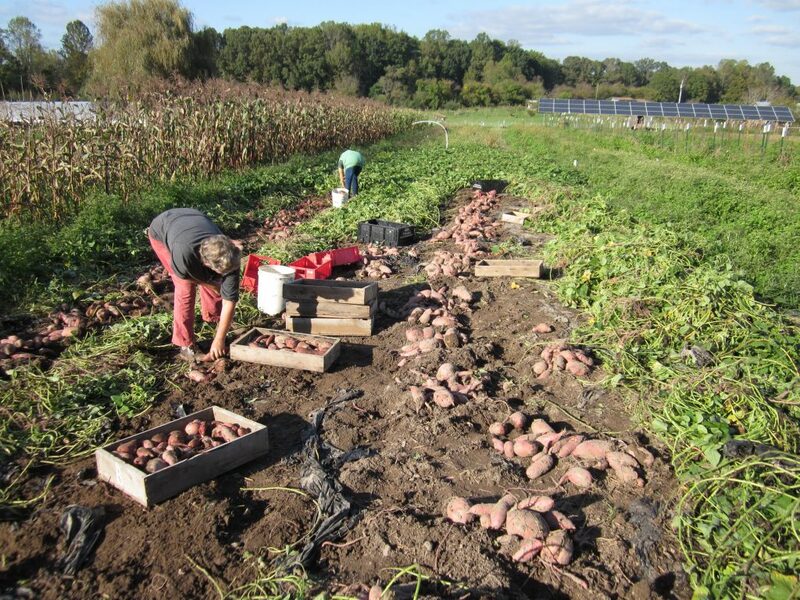 The 2-node beds produced about 500 pounds per bed, of relatively few, very large (6 – 20 lb) sweet potatoes. The plants with 3+ nodes in the soil gave more reasonable sized potatoes. They tend to get jumbos, so they have started planting closer (10″) to tackle this – not many customers want jumbos. In his article in Growing for Market, Anthony Boutard pointed out that single-node cuttings do produce fewer tubers which are larger and better formed. This is a big advantage for growers in the north, but less so in the south. The Arkansas growers have found that the 2-node cuttings are even better at this tendency in their location, which is much further south than Anthony Boutard’s farm. Beauregard sweet potatoes saved for seed stock. Office. Farmers deal with a very seasonal cash flow, and may well have gone into farming with good farming skills but not good business skills. Julia writes about four rules for getting out of a financial hole. Quit digging (don’t incur any more inessential expenses). Keep the dogs at bay (communicate with your creditors about how you plan to pay, and how you plan to keep producing the goods). Climb out (increase revenue in as many ways as possible). Get your head out of the sand (don’t panic, face realities, be proactive). She goes on to list 10 ways to protect yourself from getting in such a hole again. is an entire style of vegetable farming and scale of tools that have been forgotten, in between tractor work and hand growing – the scale of the walk-behind tractor. The author explains how commercially available tools can be adapted to work with a BCS or a carefully used antique walk-behind tractor. Mike Appel and Emily Oakley contributed Every farm is unique, define success your own way. Money is not the only measure. Quality of life, family time, and personal well-being are up there too, as are wider community achievements. Farming is equal parts job and lifestyle, and the authors recommend having a strategic plan for yourself and the farm, which you update every couple of years to pinpoint goals and the steps you need to take to reach them. 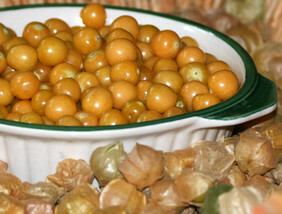 Liz Martin writes about husk cherries (ground cherries) and how to improve production of them, to make a commercial crop viable. Who would have guessed that hillling the beds before planting can make harvest so much easier, because the fruits roll down the sides? Judson Reid and Cordelia Machanoff wrotea short piece: Fertility tips and foliar testing to maximize high tunnel crops, and Gretel Adams wrote about Scaling up the flower farm. 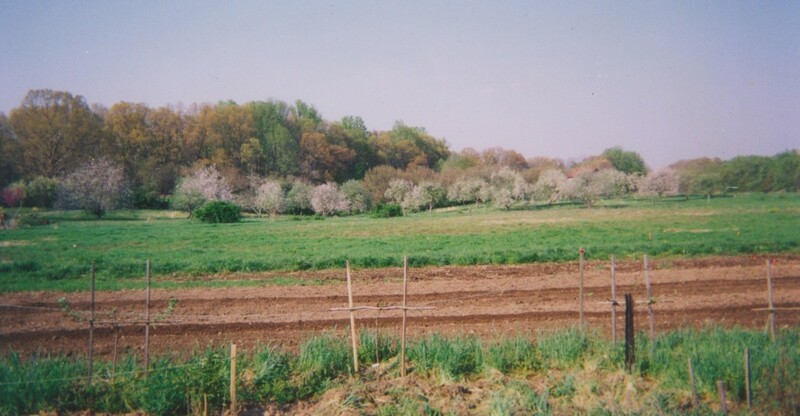 Many of the ideas also apply to vegetable farms. We still have plenty of lettuce to eat, although our first sowing of baby lettuce mix in the hoophouse has come to its bitter end, and the second sowing isn’t quite ready (I think we sowed it a bit later than intended). 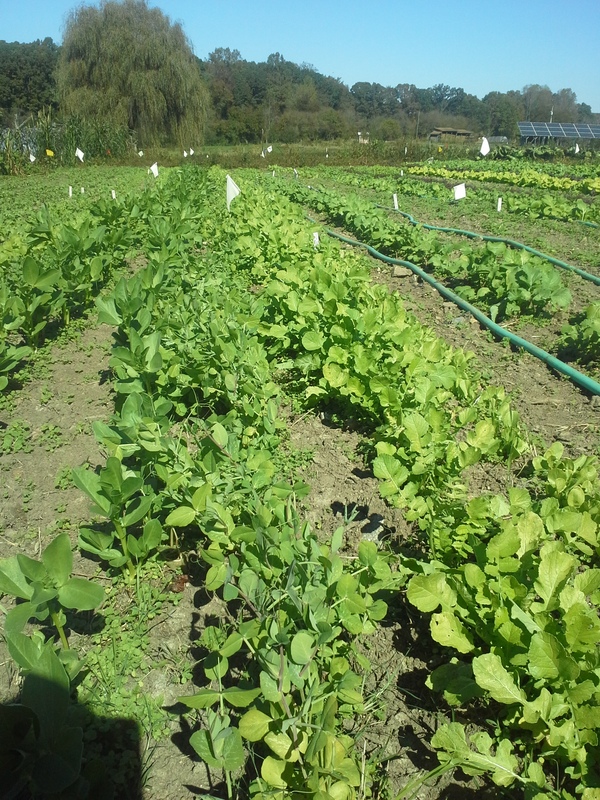 We are still harvesting leaves from the large lettuce we transplanted in October. Soon we’ll have the second and third baby lettuce mix sowings to bring a welcome change. We are about ready to transplant our first outdoor lettuce, to feed us mid-late April. September: Sow cold-hardy varieties in the second and third weeks (outdoors or in your greenhouse) to transplant into the hoophouse at 4 weeks old . October: 4 weeks after sowing, transplant those lettuces at 8” spacing to harvest leaves from mid-November to early March, rather than heads. In late October, sow the first baby lettuce mix, for up to 8 cuts from early December to late February, and sow a small patch of “filler lettuces” to replace casualties in the main plantings up until the end of December. 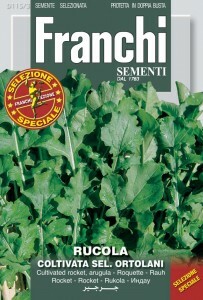 November: 11/9 sow more filler lettuce, to be planted out in the hoophouse during January. Transplant the first “filler lettuce” to replace casualties. Harvest leaves from the transplanted lettuce. 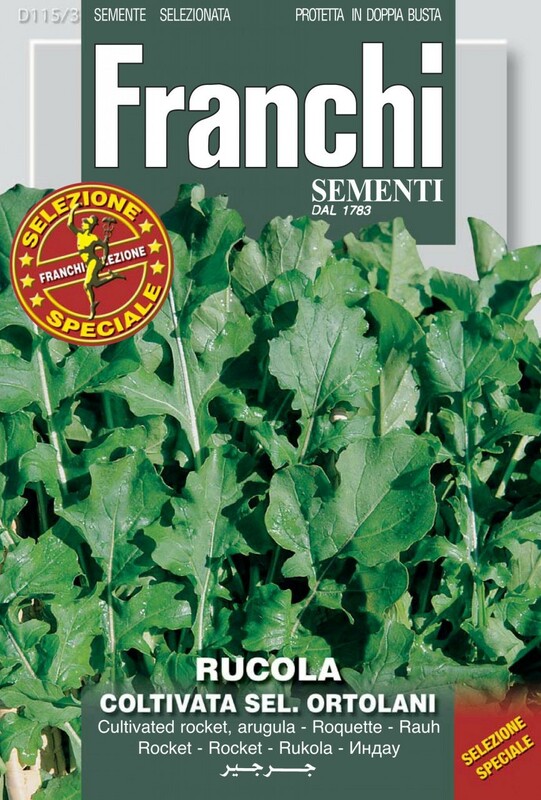 December: Use the “filler lettuce #1” to replace casualties or fill other hoophouse space, for lettuce leaves in January and February, or heads in February. At the end of December, make a second sowing of baby lettuce mix, to harvest from late February to the end of March. Harvest leaves from the transplanted lettuce, and cut the first baby lettuce mix. January: Use the “filler lettuce #2” to fill gaps in the lettuce beds up until January 25. After that is too late here for hoophouse lettuce planting, and we use spinach to fill all the gaps, regardless of the surrounding crop. Harvest leaves from the transplanted lettuce, and cut the first baby lettuce mix whenever it reaches the right size. 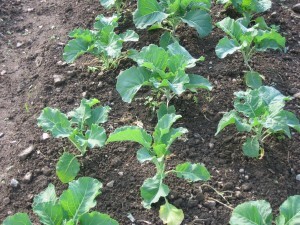 February: 2/1 sow the third baby lettuce mix, to provide up to three cuts, from mid-March to late April. 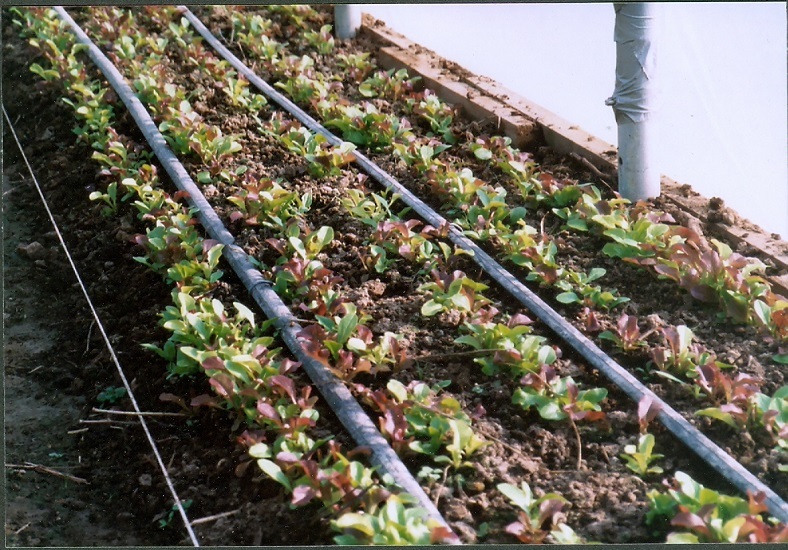 In mid-February, consider a fourth sowing of baby lettuce mix, if outdoor conditions look likely to delay outdoor harvests. Harvest leaves from the transplanted lettuce, and cut the second baby lettuce mix when it sizes up. Harvest the first baby lettuce mix, clearing it at the end of February before it gets bitter. March: Harvest leaves from the transplanted lettuce, and cut the second baby lettuce mix whenever it reaches size. Cut the third baby lettuce mix when it sizes up. April: In the first half of the month, harvest the last of the transplanted lettuce as heads . Continue to cut the third baby lettuce mix until it gets bitter. Cut the fourth baby lettuce mix when it sizes up. Outdoor lettuce heads are usually ready for harvest mid-April. Plan to have enough hoophouse harvests until the outdoor harvests can take over. 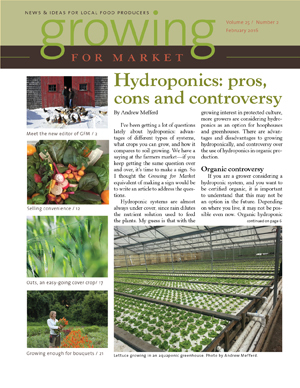 The February issue of Growing for Market is out, including my article How to decide which crops to grow which I previewed some of here last August. 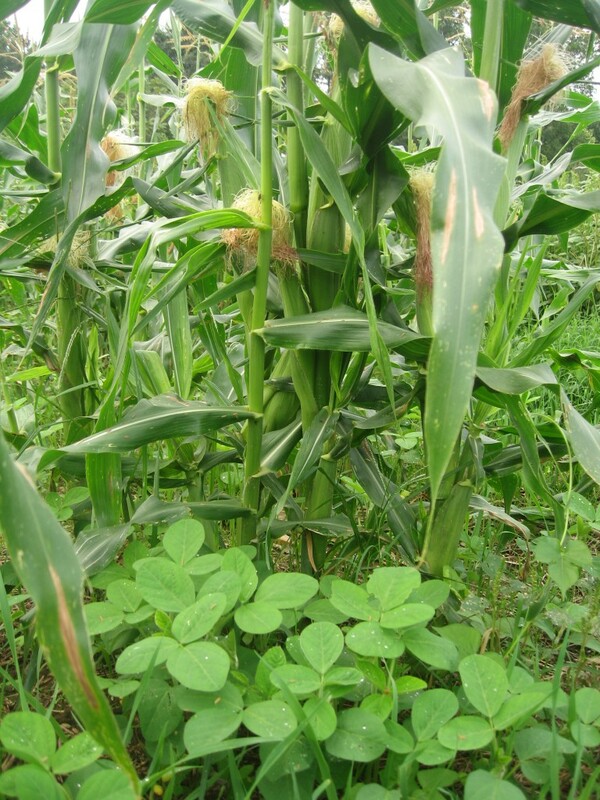 I also included some of the material in my slideshow Diversify Your Vegetable Crops. Click the link to see the slideshow. This past winter we used this kind of process to reduce the amount of garden work for 2017. I’m retiring from garden management and the new managers want to stay sane and not be exhausted all the time. We have fewer workers this year (the past few years actually), so we needed to slim down the garden and not go crazy trying to do everything we’ve done in the past. I’ll still be working in the hoophouse, the greenhouse, and doing some outdoor work, as well as being available to answer questions and provide some training when asked. Back to Growing for Market. There’s a great article for new small-scale growers, from Katherine Cresswell in northern Idaho, Year One Decision Making, about starting a farm with only one implement. Careful planning lead Katherine and her partner Spencer to focus on fall, winter and spring vegetables, as no-one else around them provided these, and they had experience of winter growing from working on other farms. Clearly a high tunnel (hoophouse) needed to be in the plan. It was essential that they hit the ground running and have saleable produce within six months. The expense budget was very tight. They bought a BCS 739 walk-behind tractor (which they both had experience of) and a rotary plow. A very down-to-earth article to encourage any new grower with limited means. 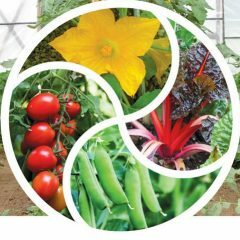 There are reviews of three new books by GfM writers: Compact Farms by Josh Volk, Floret Farm’s Cut Flower Garden and The Greenhouse and Hoophouse Growers Handbook by Andrew Mefferd, the editor of GfM. 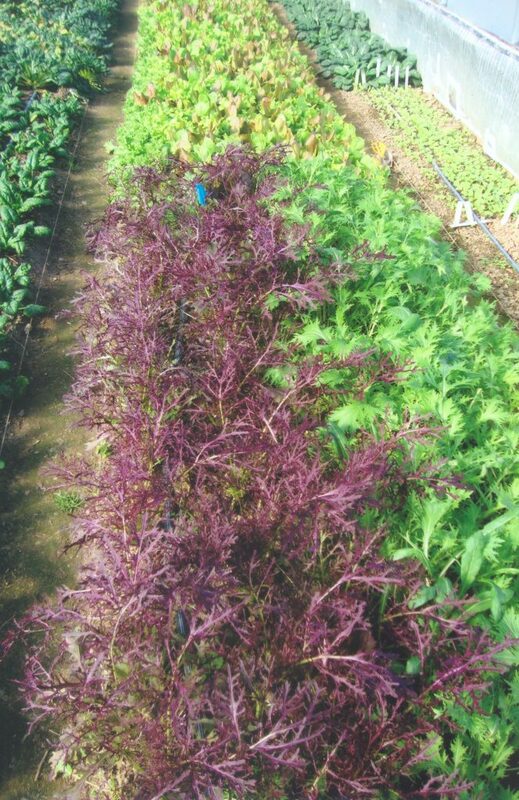 Brett Grohsgal has written a valuable article about his 15 years experience with on-farm breeding of winter-hardy vegetables, both in the field and under protection of hoophouses. Informative and inspiring. Erin Benzakein has written about rudbeckias, the unsung heroes of summer bouquets, and Gretel Adams has written on new flower varieties to try in 2017. 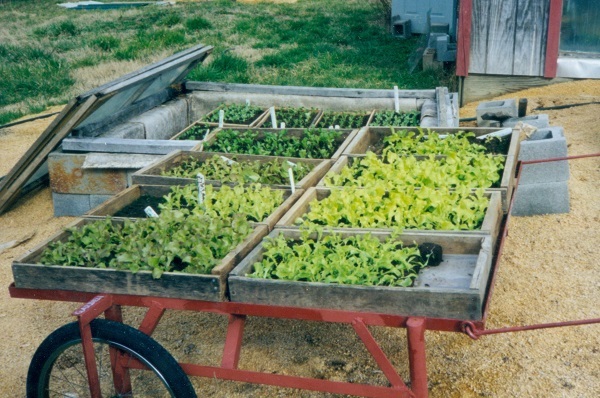 I have a new post on the Mother Earth News Organic Gardening blog, Using Open Flats (Seed Trays) to Grow Sturdy Seedlings Easily – How to make reusable wood flats (seed trays) for seedlings, and use them to grow sturdy vegetable starts to transplant into your garden. This is a way to avoid contributing to the problem of agricultural plastic trash and be self-reliant in gardening equipment. You can also grow stronger plants by giving them a larger compost volume than plug flats or cell packs provide. 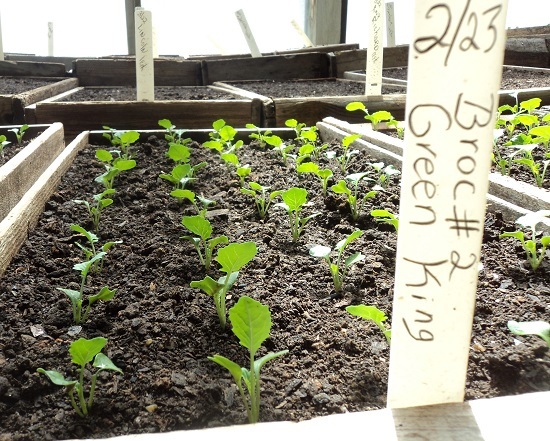 Open flat of broccoli seedlings. 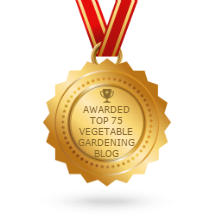 I heard that my MEN blogpost Green Potato Myths and 10 Steps to Safe Potato Eating was very popular in January, coming sixth in their table of most-viewed posts on all topics. This has been out there in the blog-iverse for almost 18 months, so clearly there is a lot of concern about eating healthy food and not wasting what we’ve grown. Sorting potatoes two weeks after harvest to remove problem potatoes before rot spreads. The false spring has been barreling along. Last week I reported that we’ve seen a flowering crocus (2/17). Since then, we’ve seen daffodils and dandelions flowering, heard spring peppers and already the maple is flowering (2/25). These are all markers on our phenology list. The maple flowers on average 3/12, with a range (before this year) of 2/28 in 2012 to 4/2 in 2014. A 9-year record broken! Now, at the height of summer, I am looking ahead to speaking events this fall, winter and next spring. (I have been in the habit of turning down presentations from May-August, so i can focus on our gardens). My first booking is the fun and local Heritage Harvest Festival at Thomas Jefferson’s house, Monticello, near Charlottesville, Virginia. Click the link above to plan your visit. 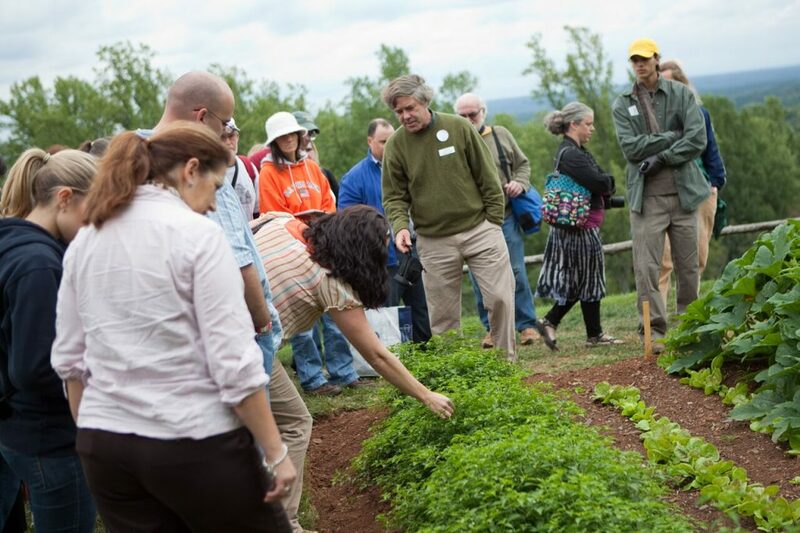 Heritage harvest Festival Speakers include Joel Salatin, Ira Wallace, Michael Twitty and many more. Friday is devoted to classroom workshops and walking tours. I will be giving my presentation on Fall Vegetable Gardening on Friday 2-3 pm. It’s a ticketed event, limited to the 32 people who can fit in the classroom. After the workshop I will be signing copies of my book from 3.15-3.45 pm at the Shop at Monticello, and chatting to whoever comes by. There are 30 other workshops on Friday, and 3 workshops on Sunday. The main event is on Saturday, with general admission from 9 am to 6 pm. 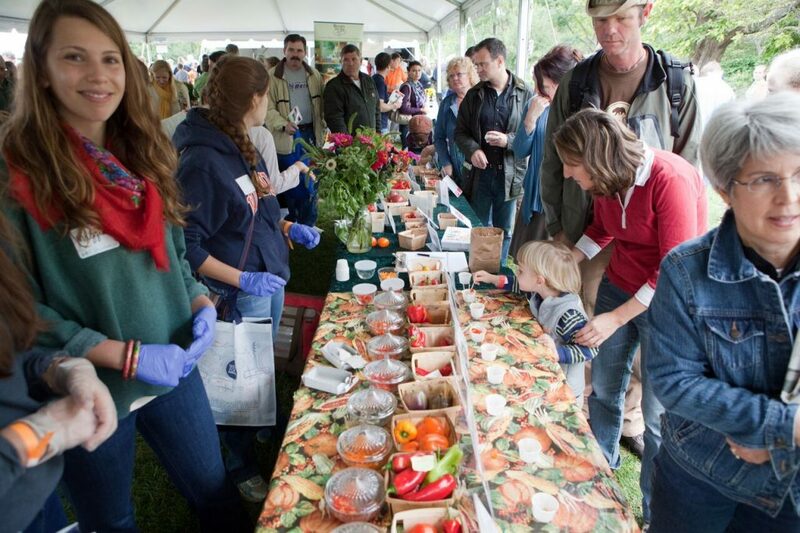 Attend some of the 16 free workshops, the Southern Exposure Seed Exchange Tomato Tasting, the Chef demos, Seed swap, Monticello Shop tent and Kids activities. Spend your hard-earned cash in the Beer garden, at the Food concessions, and at 36 Premium Workshops (with pre-paid tickets). I’ll be talking about Crop Rotations for Vegetables and Cover Crops at the Woodland Pavilion (50 seats) from 1.45 – 2.15 pm, followed by book signing at the Shop again. 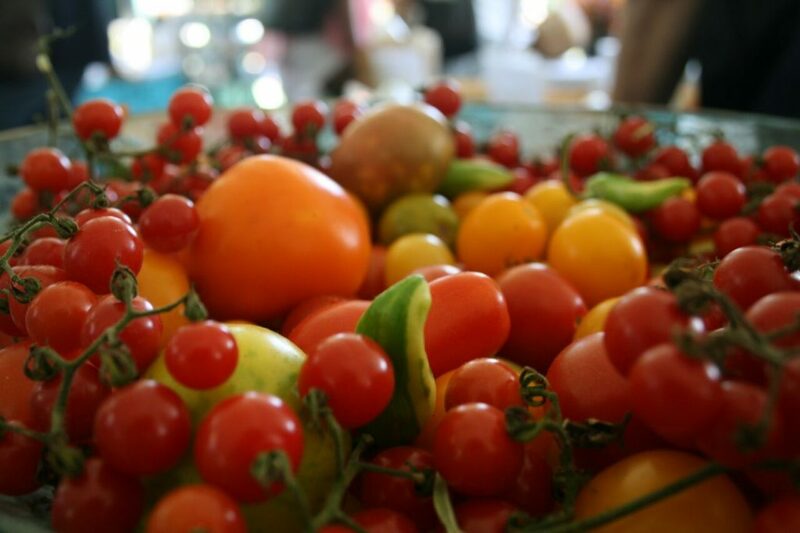 If your tomatoes don’t look as wonderful as those in the Monticello photo above, you might be casting around for descriptions and photos of problems. 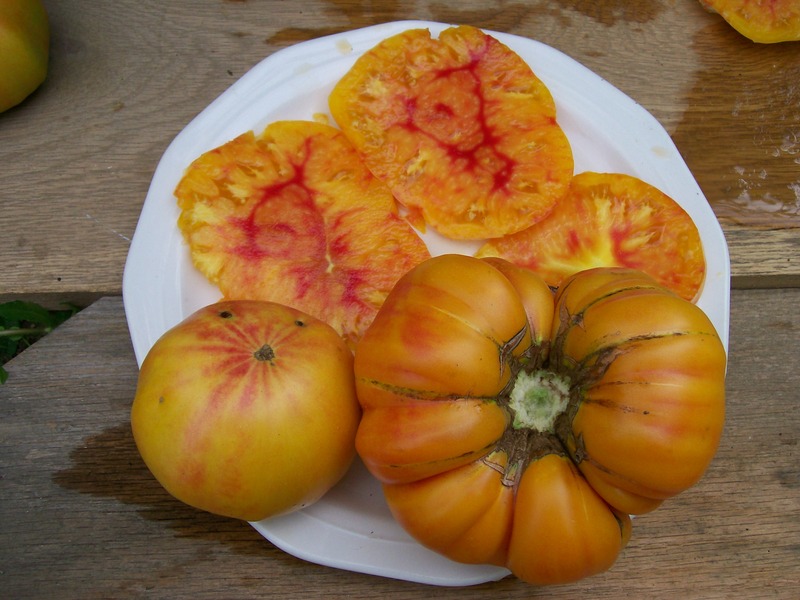 Margaret Roach in her blog A Way to Garden, recently posted an interview with Dr Meg McGrath about tomato diseases, with photos. If you are worrying about Late Blight, you can sign up for alerts, although when I tried, my computer warned me the link to www.usablight.org was not secure. 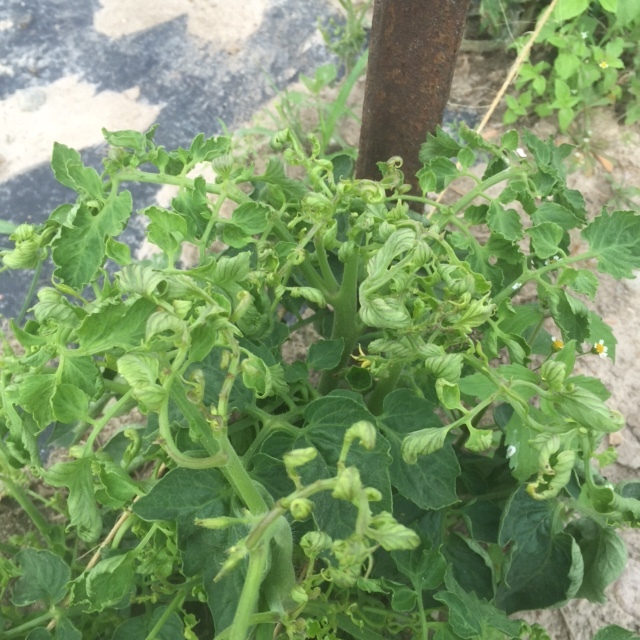 Margaret Roach’s Tomato Troubles FAQs has some good descriptions and many helpful links. One of the links is to Tom Stearn’s “tomato hygiene” management method. 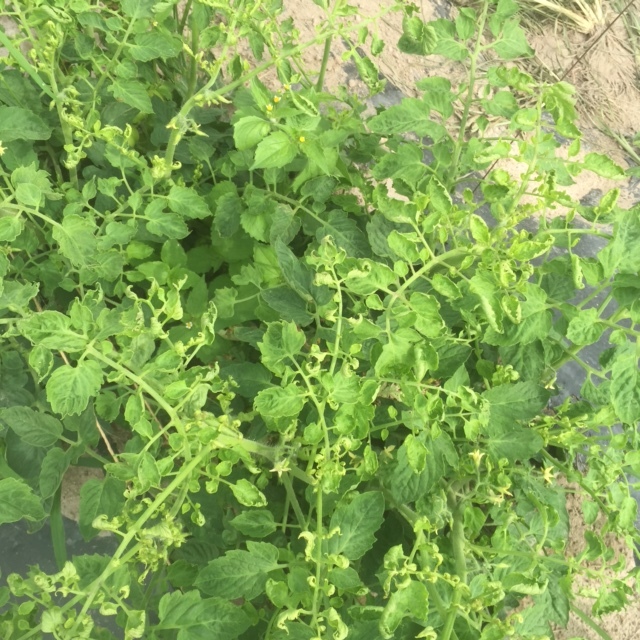 We had trouble with our paste tomatoes, and got excellent help from the Plant Disease Clinic of the Virginia Cooperative Extension. Sadly, some of our plants seem to have been victim of some herbicide drift or cross-contamination, despite our best efforts to run our garden organically. We don’t control what falls out of the air. Happily, the plants recovered from the stunted curling in of the leaves, and are starting to pump out good yields. I hate the thought that we will be eating slightly poisoned tomatoes, even though they are still much better than commercially grown non-organic produce. The August issue of Growing for Market magazine is out, along with my article about planning winter and early spring hoophouse harvests. Beet greens, mizuna and frilly mustards, radishes, salad mix, spinach, tatsoi, thinnings of chard, baby turnips and greens for salad mix. We still have leaf lettuce outdoors, and only harvest from the hoophouse lettuce if the weather is bad outdoors. Arugula, brassica baby salad mix, Bulls Blood Beet greens, chard for salad, Chinese cabbage, kale, leaf lettuce, baby lettuce mix, maruba santoh, mizuna and frilly mustards, pak choy, radishes, salad mix, scallions, senposai, nspinach, tatsoi, Tokyo bekana, turnips and greens, yukina savoy. Hoophouse mizuna and lettuce mix. salad mix, scallions, senposai, spinach, tatsoi, Tokyo bekana, turnips and greens, yukina savoy. scallions, senposai, spinach, tatsoi, turnips and greens, yukina savoy. Arugula, brassica baby salad mix, Bulls Blood Beet greens, chard, kale, leaf lettuce, lettuce heads, baby lettuce mix, mizuna and frilly mustards, radishes, salad mix, scallions, senposai, spinach, tatsoi, turnips and greens, yukina savoy. 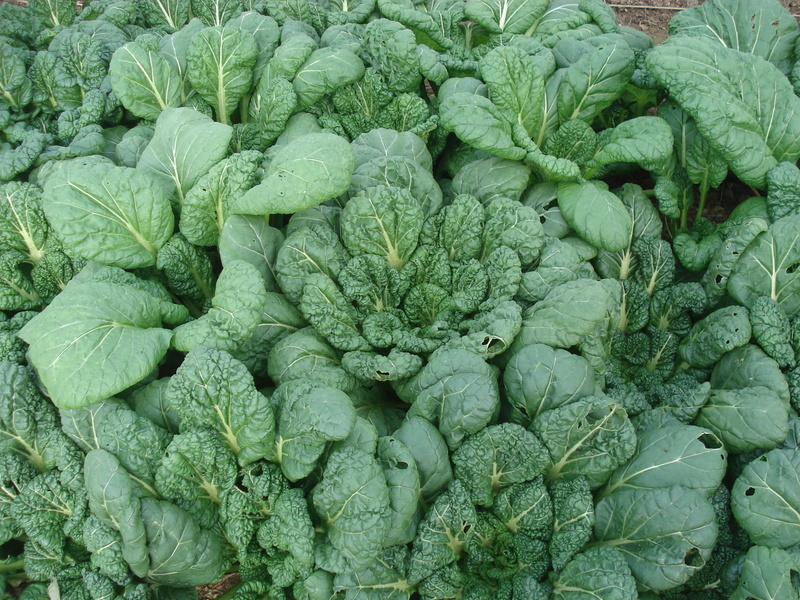 Brassica baby salad mix, Bulls Blood Beet greens, chard, kale, leaf lettuce (may end in early April), lettuce heads (until late April, then lettuce from outdoors), baby lettuce mix, mizuna and frilly mustards, radishes, salad mix, scallions, spinach. 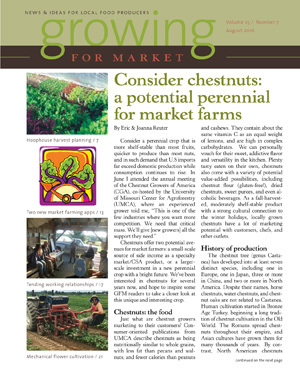 Other great articles include one by Eric and Joanna Reuter about growing chestnuts, one by Gretel Adams about growing flowers without plastic, including the wonderfully simple idea of fastening C-clamps on the bottom of the hood over the tiller to mark rows in the soil. There are reviews of two farming phone apps, one for CSA farmers and one called BeetClock, based of Richard Wiswall’s Organic Farmer’s Business Handbook. 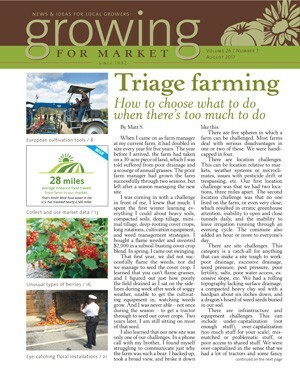 The summer issue of Growing for Market (June/July) has been out for a couple of weeks. We’re having a very rainy Fourth of July, so that pushed my mind towards good reading material. Assuming you stayed home and didn’t join the millions on the roads. 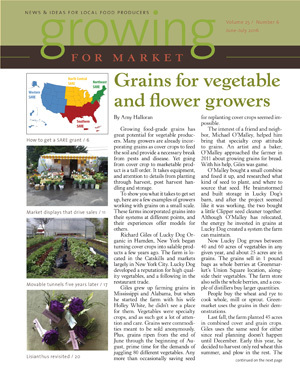 This issue has an interesting article by Amy Halloran about sustainably grown food grains as an addition to the crop portfolio for vegetable and flower producers. Sometimes we’re looking to diversify our crops to help the rotation (thwart the usual pests and diseases), or to even out the workload over the year. Local artisanal bakers and brewers might be looking for locally grown grain, or you can sell small bags alongside your vegetables. One advantage of grains is that they have a good shelf-life, so you can bring them out to your CSA or you market when you wan to add something new and different. Heirloom grains and dry beans have appeal for those who want to return to their roots. 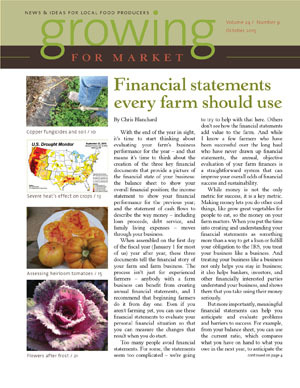 Eric and Joanna Reuter wrote a helpful farmers’ guide to applying for a SARE grant. They give a clear overview explanation, then a step-by-step guide to how to apply. They talk about how to design a suitable project, how to set it up, run it, evaluate and fit with the deadlines. They include an example of a SARE farmer-directed research project that changed their farm management. It was Kevin Cooley’s pilot project using supermarket baskets (factory seconds) to harvest, wash and store vegetables. The vegetables stay in the basket they’re picked into. It saves a lot of time and reduced handling. 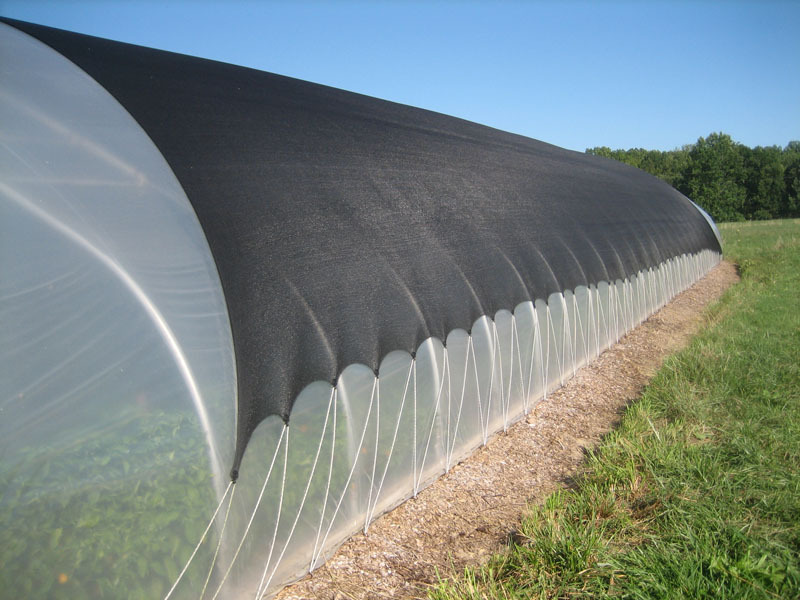 Wendy Carpenter wrote a very useful article reviewing use of moveable high tunnels. Five years have passed since this idea really took off, and they are no longer “flavor of the month.” Unsurprisingly, there are pros and cons to using a moveable tunnel, and many cautionary tales. If you are thinking of buying a slideable/dragable tunnel, and especially if you are thinking of designing and building your own hardware, read this article first! Save money and tears! Like many people, I was intrigued by the idea of having a hoophouse that could have a summer home and a winter home. But after some reading and reflection, I’ve come down on the side of staying put, for us. We value a draft-free winter hoophouse (moveable ones can be hard to close up well.) I have been nervous enough when we have high winds – I don’t want to add to that uncertainty. And we have a crop rotation worked out that suits us. 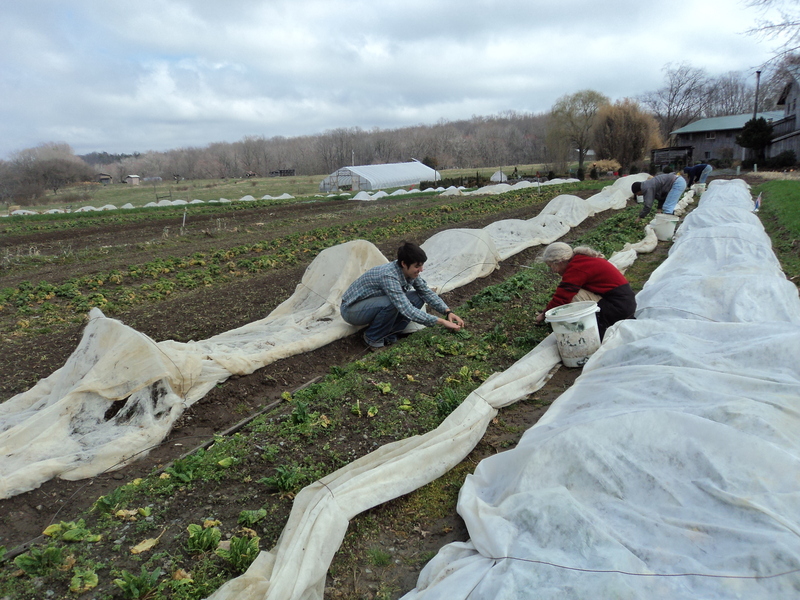 We gradually replace the winter and early spring greens with early tomatoes, peppers, squash. Our climate is warm enough that we don’t need it to grow these crops in the hoophouse in the height of summer – they do fine outside. 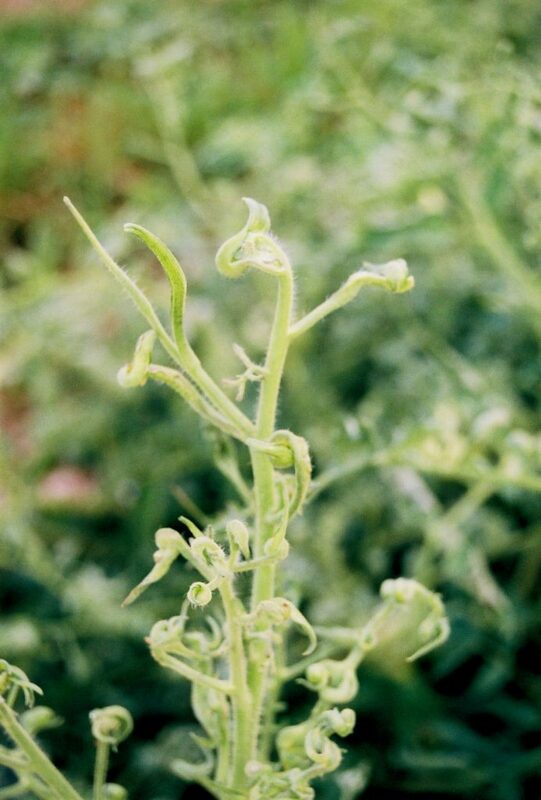 Growers in colder climate zones like to use their tunnels for nightshades and cucurbits all summer, which can make crop rotation difficult. I can see the benefit they get from a moveable house. In high summer we grow a bean seed crop, which helps our rotation, improves the soil and pays its way. We do use a big sheet of shade cloth over the top when it’s hot. 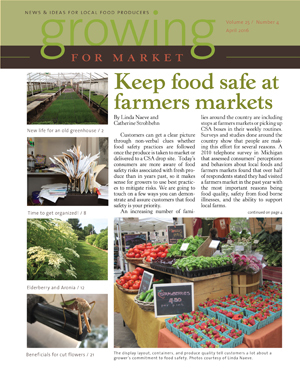 Linda Hepler Beaty writes about adding a “WOW factor” to farmers market booths. Gretel Adams provides new information about growing lisianthus, a popular topic she has covered before. Theirs are grown in a hoophouse, using horizontal netting to keep the stems upright. The Organic Broadcaster for May/June has been out (but I’ve been too busy to read it. . . ) it includes articles about industrial hemp farming, sprouted fodder grains, working on the National Organic Standards Board, transitioning to Organic, assessing the financial wisdom of buying machinery, the impact of warm season grasses on organic dairy cows, farming for wildlife with hedgerows (including elderberry and currants), a review of Lisa Kivirist’s book about women farmers Soil Sisters, farm safety for children, and there is the usual round up of organic field days and events, news briefs, and classified ads. The 20 pages are packed! Lisa Kivirist and her newest book. 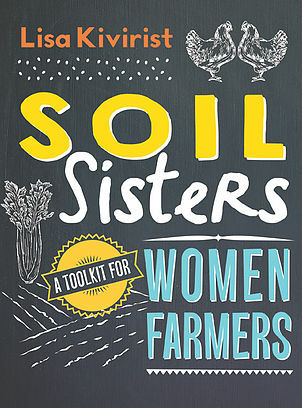 See this site for details of an August Soil Sisters event in Wisconsin. 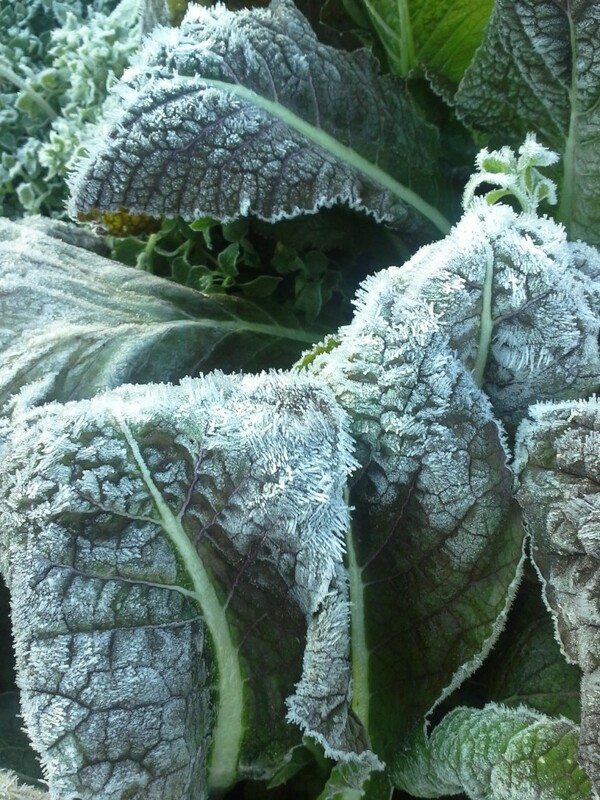 Eat-all greens: frosty Red Giant Mustard in December. Best was (were?) the Morris Heading collards. We grow these overwinter in our garden too, and we are enjoying eating those. This photo shows young plants before they reached full size. Also still showing some life were Purple Top White Globe turnips, Ortolani Market Grower arugula and some (not all) of the Hanover kale (which is after all, a Siberian spring kale, not recommended for over-winter growing). It will be interesting to see if any of these survive until mid-February, when we will need to disk the plot (El Nino willing) to plant some new grape vines along one side. 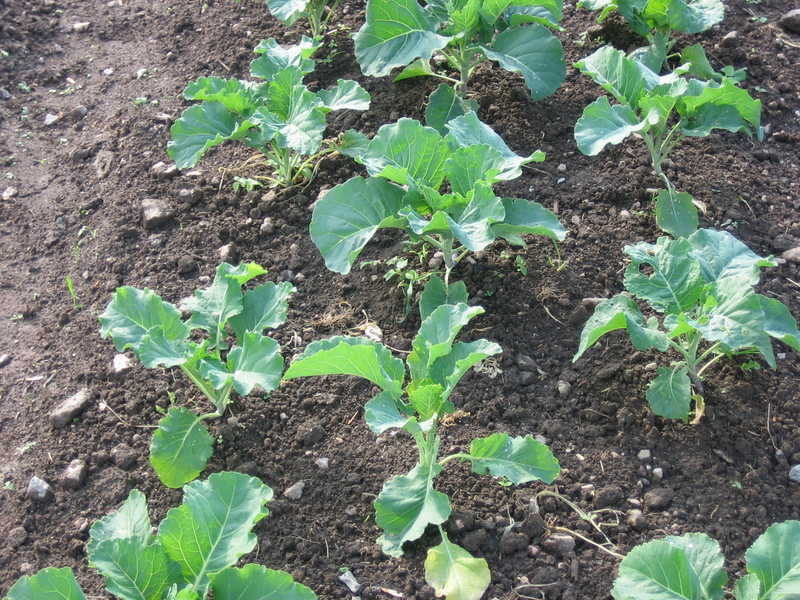 This plot is also my back-up area in case the plot where we want to plant our spring cabbage and broccoli is too wet when the time comes. The rotation puts these in the wettest part of our gardens. I have written up our Eat-All Greens for Growing for Market magazine and you can read it in the January issue. 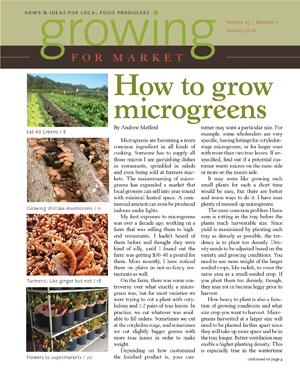 In this issue you can also read an article by the new editor Andrew Mefferd about growing microgreens. I’ve never grown these, so I valued getting professional tips from someone who has. How not to grow them (sowing too thickly, using expensive potting soil when you don’t need to, over-watering, under-ventilating. He also includes tips on which seeds are best for microgreens, and how to tidily harvest. If you want to add microgreens to your market crops, a sub to Growing for Market will repay you pretty quickly with just this one article. And if you are growing them at home, it will save you lots of frustration. The long-time editor, Lynn Byczynski, who is retiring, has an article about growing turmeric, which has similar growing requirements to ginger (but a bit easier). 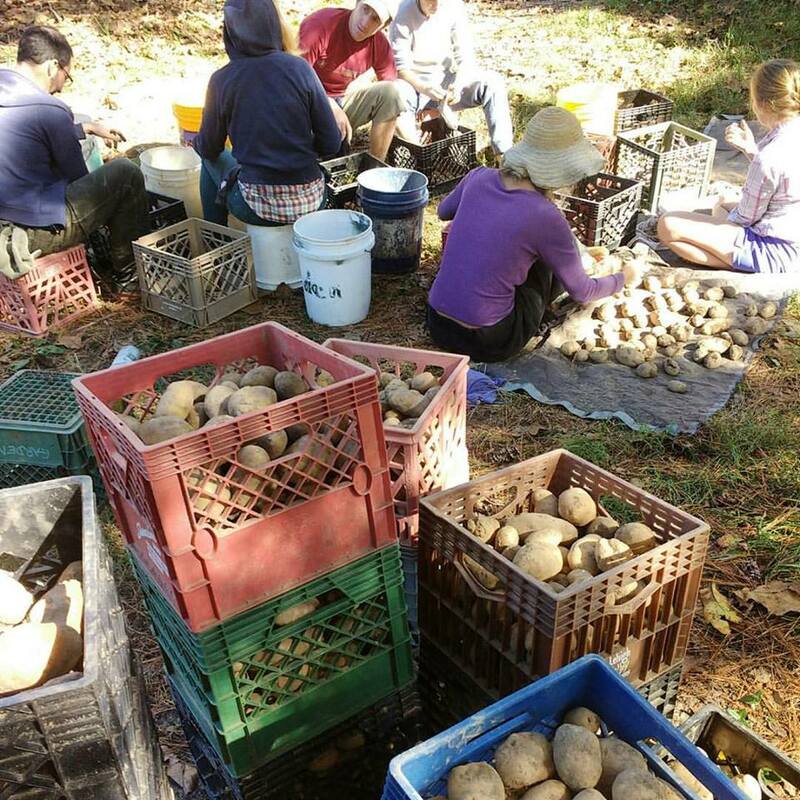 Eric and Joanna Reuter have written about raising shiitakes for market. Gretel Adams has written about selling cut flowers to supermarkets, which has served her as a good way to increase sales volume. All good inspirational reading while the weather doesn’t encourage working outdoors! 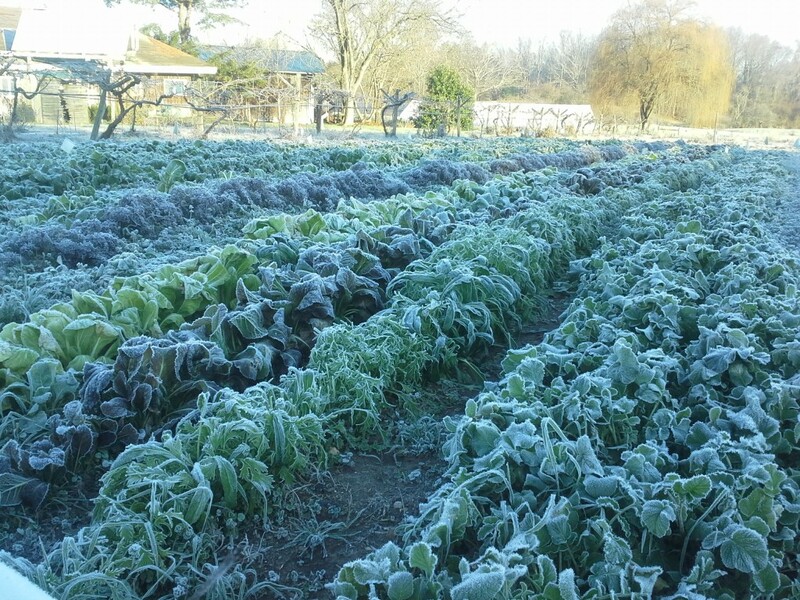 Eat-All Greens rows with frost in December. 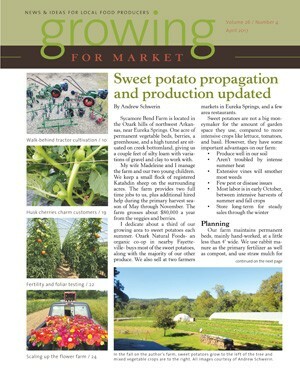 The October issue of Growing for Market is out, including my article about heirloom tomatoes. It’s an assessment of tomato varieties we have grown, mostly in our hoophouse, and how they’ve done in central Virginia. When we decide to try a new variety, we first grow just two plants, in our hoophouse with all the other weird and wonderful types we like, and a bed of early-maturing varieties like Stupice and Glacier. We also grow non-heirlooms, including hybrids like Sun Gold. We track whether we like the flavor, how productive they are and how disease-resistant they are. Striped German tomato in all its beauty. Grape F1, Garden Peach, Jubilee, Mountain Magic F1, Reisentraube, and for simple delicious reds, Tropic. We love Cherokee Purple and Striped German, but they *appear* not to be very productive. 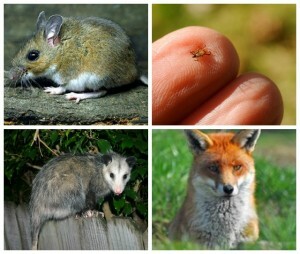 I suspect browsers got them all! This GfM also includes practical help with financial reports from farmer Chris Blanchard, a consideration of copper-based fungicides and their bad effect on soil health, from Meredith Melendez,an Agricultural and Resource Management Agent for Rutgers Cooperative Extension. Organic farmers need to take more mindful care when using copper compounds, even when facing Late Blight. Alexandra Amonette writes from Washington state about dealing with the extreme heat this summer, and Gretel Adams encourages flower farmers to hang in there producing hardy cuts for the last part of the year. Detail of string-weaving tomatoes: locking the twine by crossing the second wrap over the first. 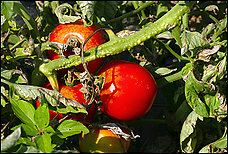 Mother Earth News Organic Gardening blog has published my post on string-weaving tomatoes. 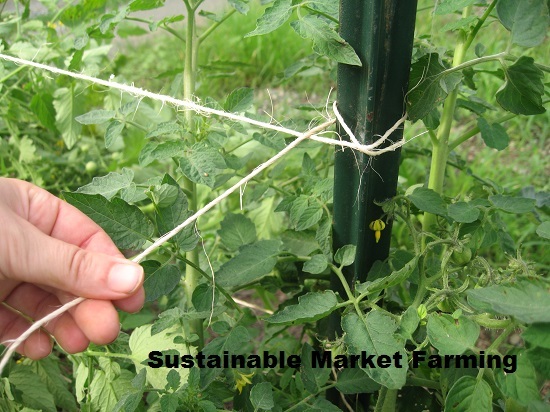 If you are considering a different support system for your long rows of tomatoes next year, give string weaving a go! 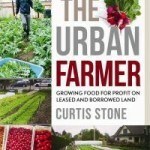 I heard my book Sustainable Market Farming got a great review in Acres USA although I haven’t seen a copy yet. We’re in the transitional period in our hoophouse, planting the winter crops. Today is Yukina Savoy transplanting and tatsoi thinning day. As an aid for future winter hoophouse planning I’ve been working on a chart of soil temperatures for best germination of vegetables, and how many days it takes for germination of each vegetable at different temperatures. This chart is a work in progress, so if you have any gems of information to contribute, do leave a comment. For instance, if you firm up any of the uncertainties, or if your experience contradicts what’s written here, I’d love to know! Click to open the pdf. Yukina Savoy in November in our hoophouse. And a blog I’ve just signed-up for is from the same Chris Blanchard who writes for Growing for Market. It’s the Purple Pitchfork or the Flying Rutabaga (the weekly newsletter). 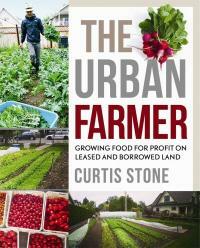 Packed with info on farming, based on real experience, from someone who is paying close attention.